Hey, dads! Stepping up your parenting game may be way simpler than you think. 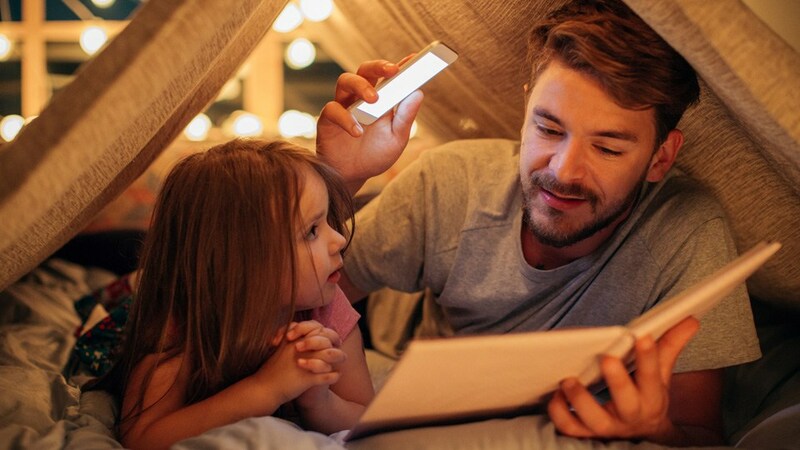 According to a new study by New York University, when dads spend time reading to their kids on a regular basis, the kids aren’t the only ones who benefit. Fathers who make a practice of reading with their kids actually become better parents over time. These findings were based on researcher observations and surveys completed during an eight-week preschool readiness program hosted by NYU and Head Start. Fathers were specifically recruited for this program in hopes of breaking the trend of mother-centric parenting programs. And since fathers are less likely to sign up for a parenting class, framing it as an educational resource for their children made the program more attractive to fathers. In addition to participating in the 90-minute program once a week, fathers were also asked to read to their children in the home on a regular basis. At the end of the eight weeks, researchers reported that the children had shown a 30 percent improvement in their school-readiness and language-development scores — and the fathers’ parenting behaviors improved by 30 percent as well. The behaviors being judged included creating routines with their children, offering rewards for positive behavior and ignoring attention-seeking behavior in their children. Since all of the participants in this study were living in a low-income community, it isn’t clear whether such drastic results can be generalized to all fathers or if the methods would attract fathers in other life circumstances. One thing is clear: Making a habit of reading to your kids is a good idea. We asked a few dads which titles they look forward to reading to their own kids at the end of the day or on a lazy Saturday morning so you can start collecting for your own home library. For dads of younger children, funny voices and sounds along with clever storylines were the most popular. Dragons Love Tacos, Mustache Baby and Rawr! are favorites for Drew W. and his 2-year-old daughter. Other popular reads for preschoolers and toddlers included The Goodnight Train, Stuck, Bicycle Bear, Harold and the Purple Crayon, The Jesus Storybook Bible and The Snowy Day. Dads of older kids: We didn’t forget about you. Chelsea B. spoke up for her dad, sharing that they read through the Chronicles of Narnia together multiple times when she was a kid. Another dad is reading through the Harry Potter series with his kids just like his dad had with him, and Nels C. just started reading Farmer Boy with his four children before bed each night. Of course, if none of these books hit the target for you and your kids, that’s OK. The important thing isn’t really what you read but that you do it. So dads, be sure to dust off your library card and set a time to read to your kids each day. You’ll be a better person for it.